SAN JUAN, Puerto Rico — Locked out of his home and with nowhere else to go, Wilfredo Ortiz Marrero rode out Hurricane Maria inside a Jeep, which was lifted off its wheels by floodwaters in the parking lot. He then endured days without enough food or running water. 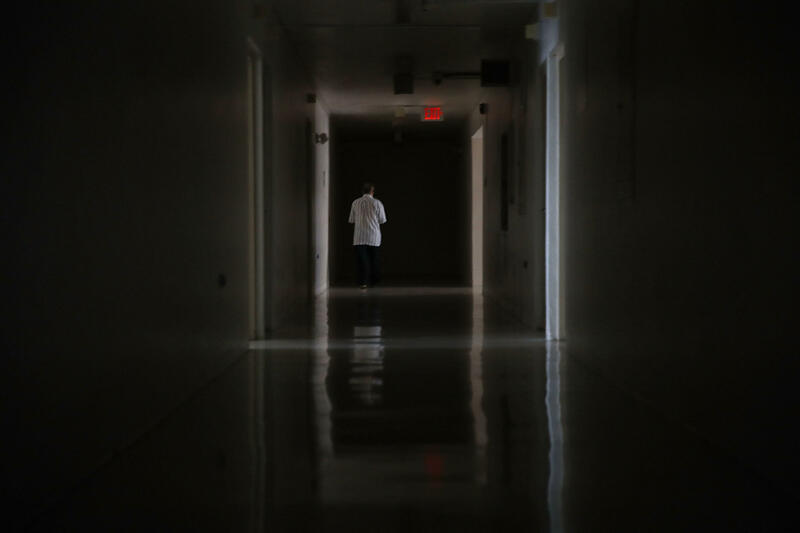 The lights are back on at his residence for low-income elderly people in the San Juan suburb of Trujillo Alto, and food has started arriving, but he still waits as long as he can each night to leave the company of others in the lobby. Alone in his room, he sometimes starts to shake. "You get really depressed," he said Wednesday. The hurricane that pummeled Puerto Rico two weeks ago and the scarcity-marked aftermath are taking a toll on islanders' equilibrium. The U.S. territory's government counted two suicides among the death toll, which now stands at 34, and with many communities still waiting for power and clean water, there is concern about others reaching a breaking point. Students and staff at Ponce Health Sciences University are visiting shelters and people in the hardest-hit communities to provide psychological help, among other services, said Alex Ruiz, special assistant to the university's president. "People's whole worlds were taken from them," he said. "People will need the proper psychological help to get through this." One elderly woman took her own life Sunday inside a nursing home in Rio Piedras, another San Juan suburb. While the facility's director, Maria Betancourt, said she didn't believe the woman was distressed about the storm, the home was stifling hot on Wednesday after power was wiped out nearly a month ago when Hurricane Irma sideswiped the island on Sept. 7, though a generator has kept the lights on. Outside the home there were piles of garbage and fallen tree limbs piled on the side of the road. Ortiz and other residents of the low-income housing residence in Trujillo Alto said the building administration ordered them to leave ahead of Hurricane Maria, saying the building wasn't equipped to weather the storm. Some were picked up by family, but Ortiz had no relatives to come get him and had no choice but to stay in his Jeep until the storm subsided and a chain on the building's door was removed. "Everybody's drained," said Ruiz, the Ponce university official, who recently toured the city on the island's southern coast to assess people's needs. "Spirits have been broken." On Wednesday, the governor said power has been restored to 8.6 percent of Puerto Rico's customers and the government is hoping to have power back on for 25 percent within a month. Power is being restored at hospitals, and he said the government is looking into which schools can reopen. "While we are still in an emergency we are transitioning to establishing some components of normalcy," Rossello said. As time goes on, post-traumatic stress disorder (PTSD) may also become an issue for many. "PTSD doesn't develop immediately, it develops after about a month," Asim Shah, M.D., chief of the division of community psychiatry at Baylor College of Medicine, told CBS News. In children, symptoms can take longer to appear. Barbara Sattler, RN, a professor of public health at the University of San Francisco who was a first responder in the immediate aftermath of Hurricane Katrina in 2005, said following that disaster, kids were "immediately, apparently, more resilient than some of the adults." "I use the word apparently because for them, unless they had seen something tragic, then in six months to a year, they would start displaying signs of post-traumatic stress syndrome," she said. Dr. Olga Rodriguez, the dean of the Ponce Health Science University's school of medicine, said mental health problems in Puerto Rico have increased after the hurricane and need to be dealt with swiftly. "This is very important so as to minimize the impact and emotional effects," she said. "It's not easy. We're reaching some people, but the island needs more mental health professionals. If we don't act, the situation can become problematic." "People are unable to go to work, they cannot produce, they do not know when they can return to work," she said. "There's widespread despair."